This is a great song for making up your own verses! 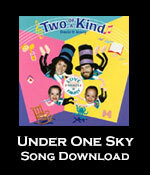 This song is also available on Two of a Kind's Love Makes A Family CD. We're angry, we're frightened, we're curious, and we're really excited!